Happy New Year! I hope your Christmas and New Year were full of celebration and laughter with people you love, and amazing food. We spent Christmas in Columbus with Andria and the rest of the OH clan. It was so fun! SUPER cold, but it was wonderful being all together. We drove down to Charlottesville, VA for New Years to visit our dears friends Whitney and Derick. AND COURTNEY CAME TO JOIN US!!! It was amazing to have two of my favorite girlfriends, Whitney and Courtney, with me at the same location. And, we made the best charcuterie plate EVER. No better way to ring in 2018. As wonderful as the holidays are, I generally start getting the itch to plan a girlfriend getaway once the new year rolls around. In case you’re in the same boat, I thought I’d share a quick and easy adventure I took with Whitney last year at the end of January. I realize it’s already mid-January, but have no fear! Whitney and I planned this trip in less than three weeks, used credit card miles, and avoided all the crowds. It was incredible. Trust me – you can do this. And, it’s so worth it. Whitney lives in VA, so we needed a meet up place that was easy for both of us to get to. 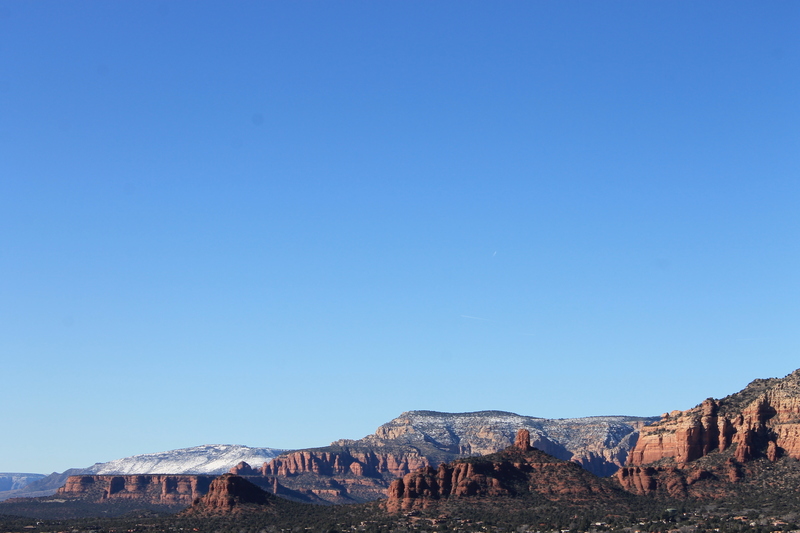 After throwing a few ideas around, we landed on Sedona, AZ. 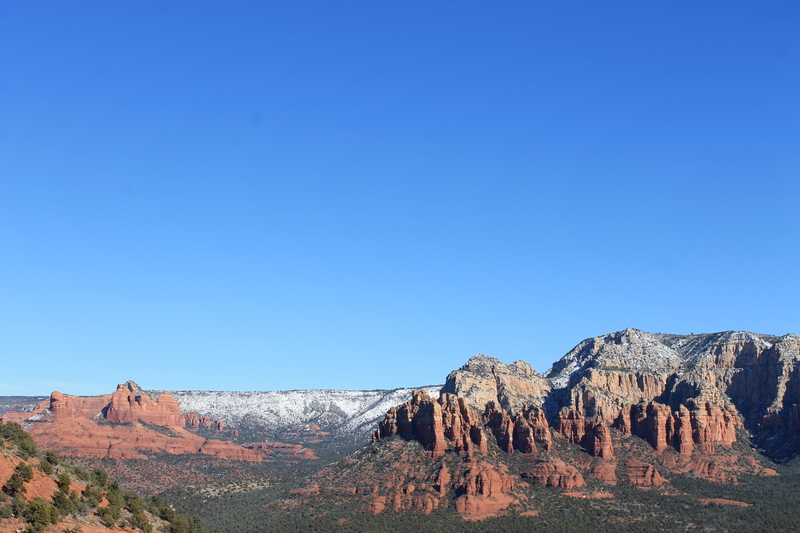 It’s an easy flight to Phoenix from just about anywhere, and then it’s a beautiful two hour drive from the Phoenix airport to Sedona. PLUS, winter is the best time to visit the desert. You may think the tropics are the only viable travel option in the winter, but you’re wrong. Winter in the desert is magical. The only things we planned ahead of time were the hotel and spa treatments, everything else was pretty much decided on the fly. We landed within 15 minutes of each other and got on the road. Starving after a glorious few hours in airplanes sans kiddos (for those of you without kids – trust me, solo travel is life-giving), we needed tacos, obviously. A quick Yelp search for best tacos in Pheonix landed us at La Santisima Gourmet Taco Shop. Yelp was right. Their tacos were amazing. I could have eaten them for every meal, forever and ever amen. The margaritas looked incredible too, but since we were driving off into the desert, we decided to hold off. Next time. The place is pretty close to the Phoenix airport, so keep it in mind if you’re in the area. I wish I’d gotten a picture, but I was too busy enjoying the amazing food and company. 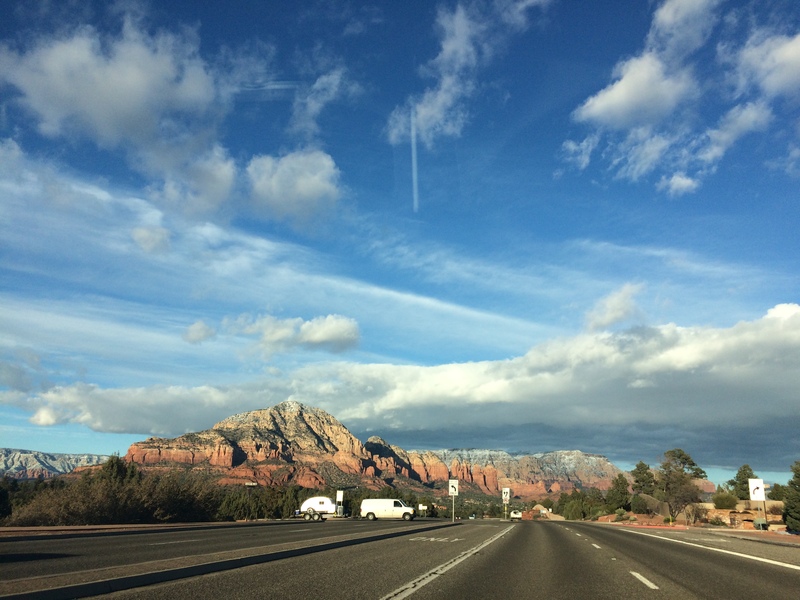 The drive to Sedona is beautiful. 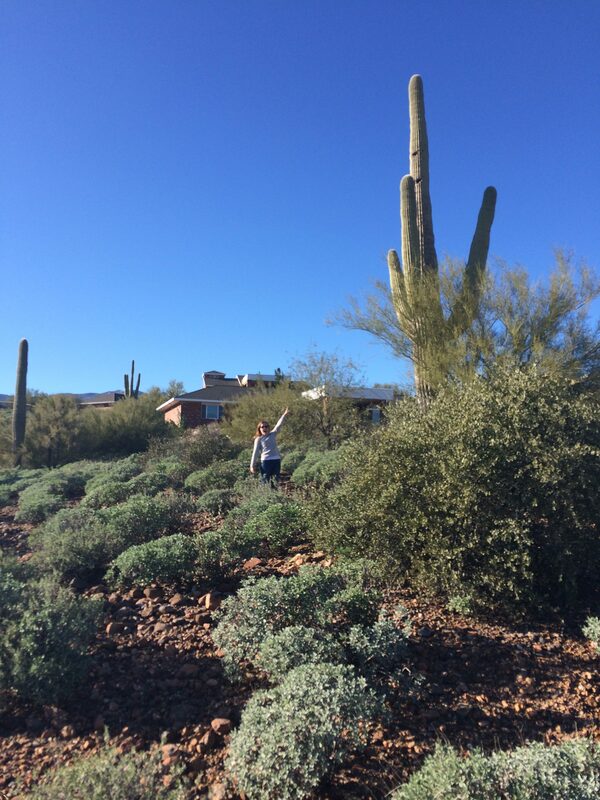 You drive through some incredible desert scenery, including huge saguaro cacti along the interstate. 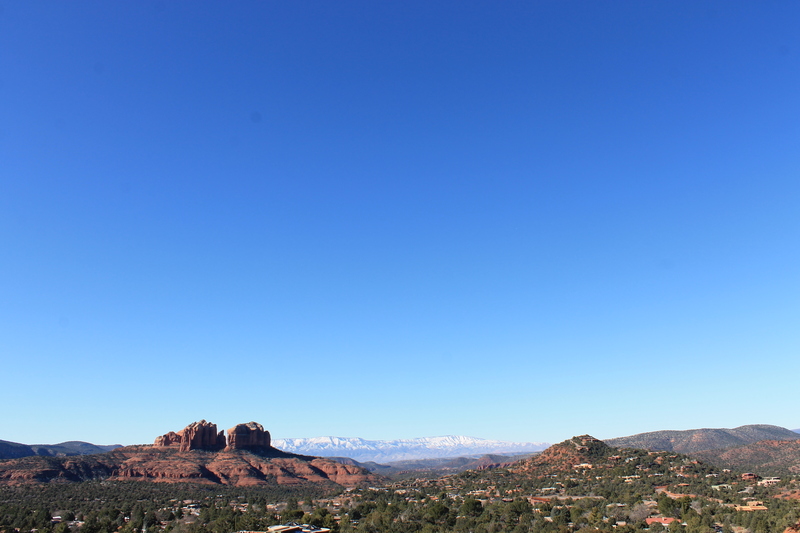 Then, you start seeing the Sedona red rocks in the distance and the real magic starts. Seriously, the vistas are breathtaking as you approach. We had pristine blue skies, making the contrast of the rocks even more beautiful. Pictures were sent back home to induce jealousy. 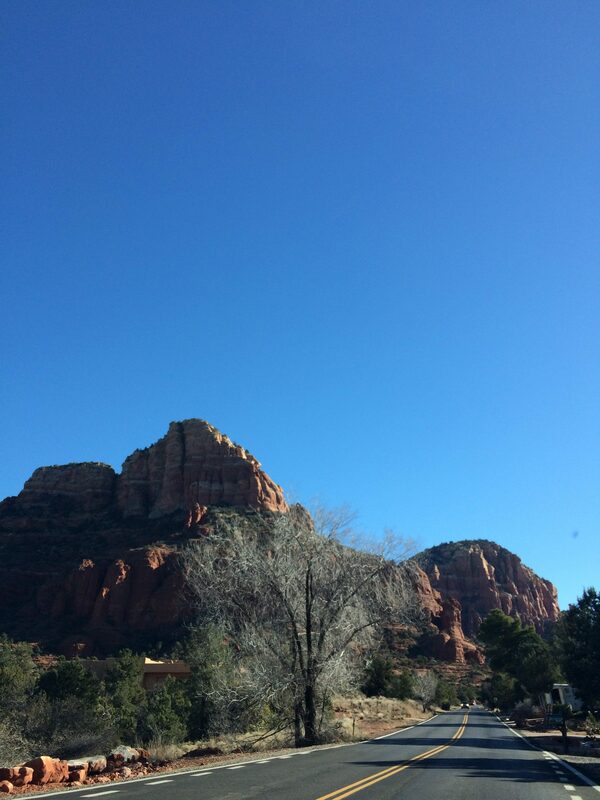 We checked into our hotel (Sedona Rouge Hotel and Spa – it was just OK. Spa treatments were amazing, more on that later.) We grabbed a glass of wine from the hotel happy hour and hit up the hot tub with a view. It was abnormally cold when we were there, it had snowed the day before, so the hot tub felt really good. We headed to downtown Sedona for dinner at Elote Cafe. It’s rated as the best restaurant in Sedona on Yelp, so it was an easy decision. The margaritas were so good, and I think they were the only ones we drank during the trip. The food was also good, but since our tacos earlier in the day at La Santisima were life-changingly good, I was somewhat underwhelmed. Apparently, this place has amazing views of the mountains, but we were there after dark and didn’t get to fully enjoy the atmosphere. I’ll definitely go back, and highly recommend hitting this place up. 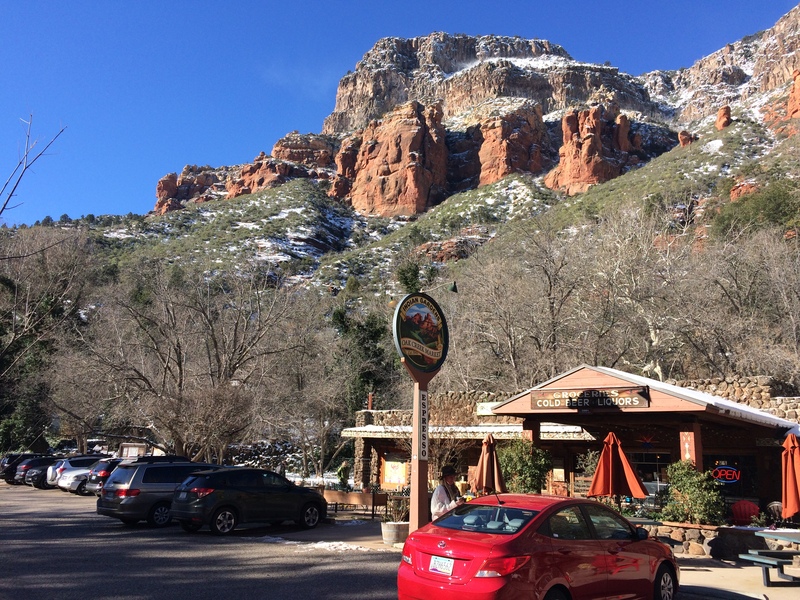 Our day started in heaven, or more accurately, Indian Gardens Cafe and Market, a few miles outside of Sedona. You drive into the mountains a bit and this place is right on the side of the highway. I would happily eat every meal at this place, too. I mean, look at how satisfied Whitney is in this picture! They serve breakfast and lunch, have a drool worthy pastry selection, and sell local foods, wine, beer, and goods. We loaded up on huevos rancheros, breakfast tacos, and coffee before heading out to visit some of the sites around town. It was REALLY cold that day, like in the 20s, so we chose places we could just drive right up to instead of doing any hiking. 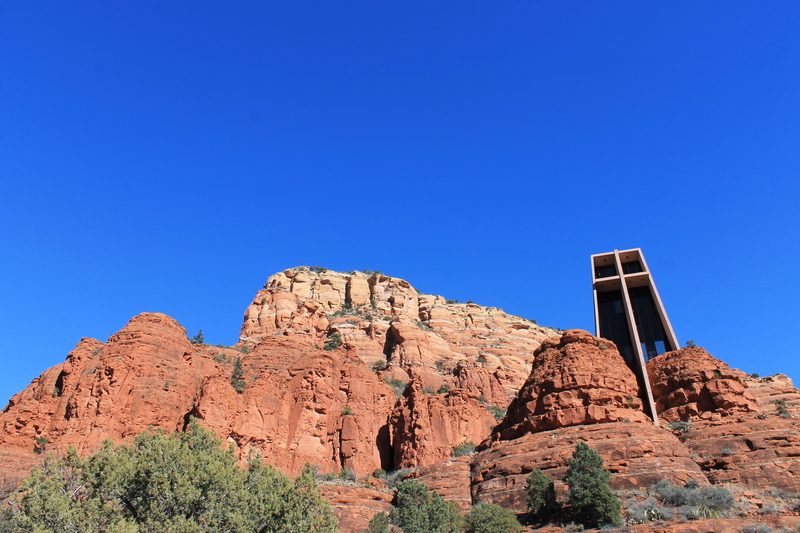 We checked out the Chapel of the Holy Cross first. The setting is insanely beautiful, and even with all the other tourists streaming around, it’s hard to not feel peaceful and connected to the beauty around you. We spent some time taking in everything in silence and lit a couple of candles inside the chapel for loved ones. There are a few short trails around the chapel that are perfect for selfie-taking. After hitting up a couple more vistas, we headed back to the hotel for our spa treatments. Oh. My. Goodness. I had the most amazing massage and Whitney got the Seven Hills aryuvedic treatment. I’m pretty sure we both walked out of there in a trance because we were so relaxed. While my treatment was one of the best I’ve ever had, I was disappointed with the rest of the spa amenities. There was a hot tub, but it wasn’t hot at all. There also weren’t rooms to relax in, saunas, etc…which I’ve come to expect from spas at that price point. So, keep that in mind if you’re looking at spa options in the area. For dinner, we headed out to Mariposa Latin Inspired Grill. 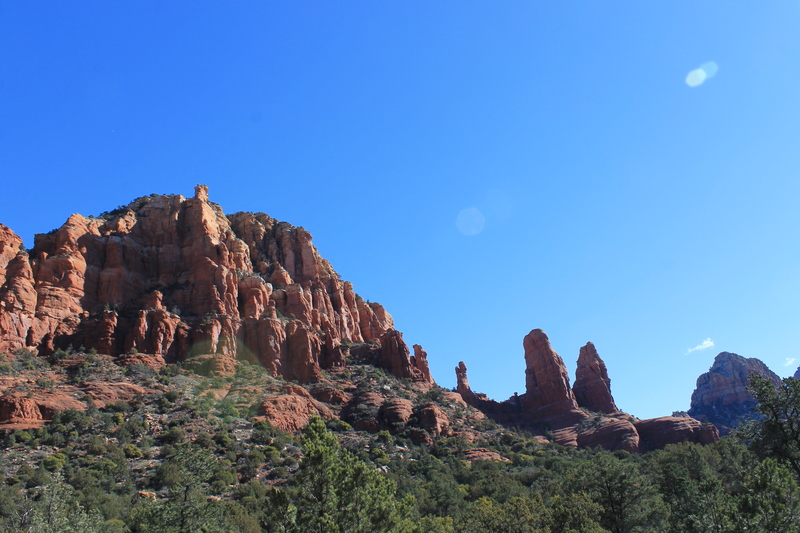 We had noticed it on our way into Sedona the night before because its location has amazing, unobstructed views of the mountains. We decided we’d hit it up at sunset the next night. Apparently we weren’t the only ones with that idea because there were no tables available without reservations. There were seats at the bar, from which you could see some of the view, but reservations will be made next time! The food and drinks were perfection, as they should be at that price. 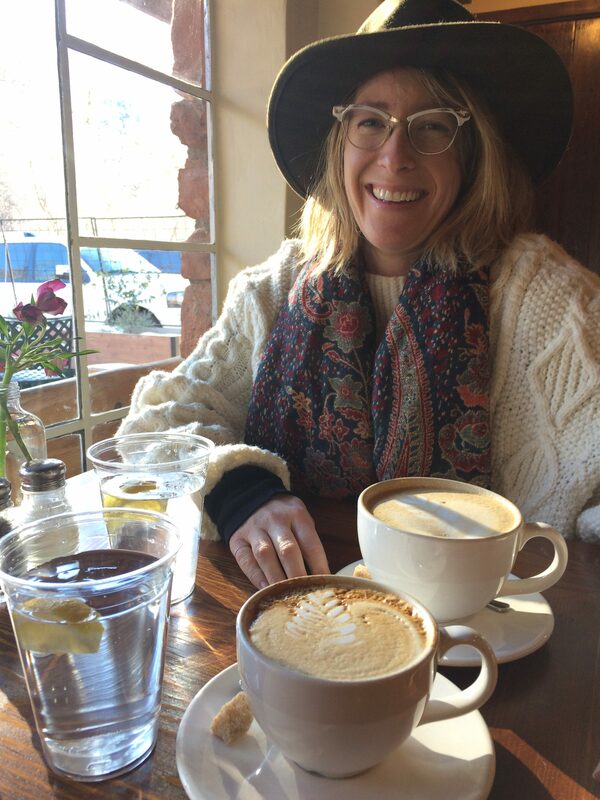 Mariposa is absolutely on my list of places to visit again – the whole experience there was top notch. We couldn’t resist the pull of the pastry display at Indian Gardens Cafe and Market, so we drove back out there to carb load before our day of hiking. There’s nothing better than flaky croissants and really good coffee. After breakfast, we went for a hike on the Soldiers Pass Trail. The trail head is right in the middle of a neighborhood, but you quickly get out into the wilderness. It’s a fairly popular trail, but we got started early enough in the day that it wasn’t too crowded. On our way back, we did run into some rowdy groups and ATV tours. SO, I recommend hitting the trail fairly early. We hiked about 4 miles, out and back. There’s so much to see in those four miles. Devil’s Kitchen, a massive sinkhole in the red rock, is at the beginning of the route. Not too much further and you run into the Seven Sacred Pools, which are beautiful. The pools were frozen when we were there, so we felt like we got to see something extra special. As we kept going, we wound through pine groves that open up to incredible vistas. I found myself just stopping and turning around in a full circle, because the 360 degree views were awe inspiring. We crested the top of a ridge and were rewarded by a whole other type of landscape. The next range of mountains changed to a lighter color rock, with varied layers of colors. It was all coated in a layer of snow. I felt incredibly lucky to experience such beauty. We hardly saw anybody at the top, the solitude in the midst of the mountains was such a gift. On a personal note, our trip was after President Trump’s Inauguration and the Refugee Ban executive order was rolled out that weekend. 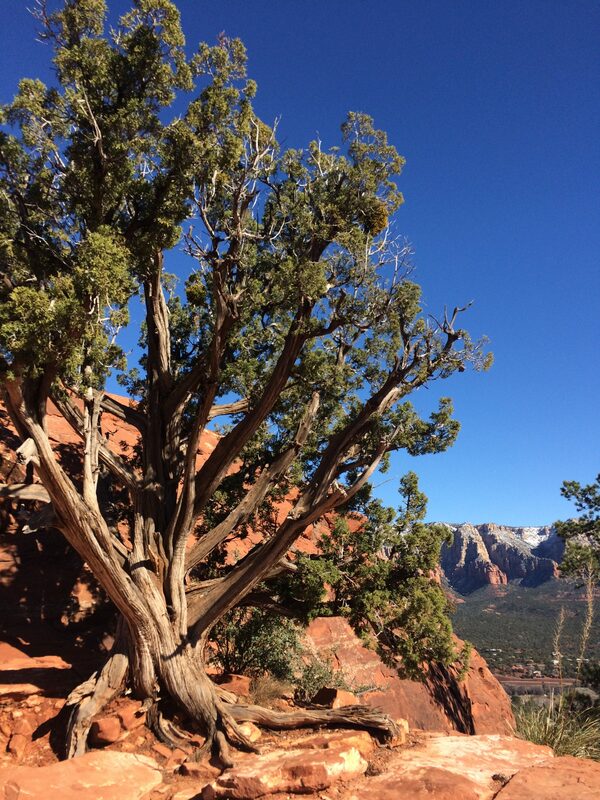 The ancient, largely unchanged beauty Sedona puts on display was a reminder that good wins in the end, and that my Creator is larger than the current circumstances. It was food for my soul. We ate lunch downtown Sedona at a decent BBQ place. It’s pretty touristy and kitschy downtown, so I don’t know that I’ll spend much time there on future visits. After lunch, we drove out to the Airport Mesa for some final views of the red rocks. 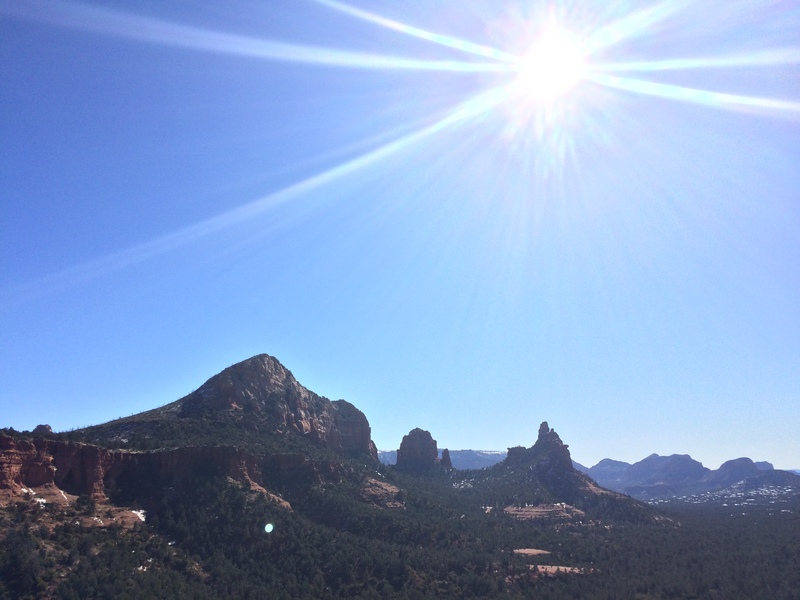 Sedona is known for their vortexes, where the earth’s energy is exceptionally concentrated. Many people travel there for spiritual refreshment. The Airport Mesa is one of these vortexes, as is the Chapel of the Holy Cross. The Seven Sacred Pools we explored on our hike is known to be full of energy also. I didn’t feel anything at any of these sites, but Whitney says she did. 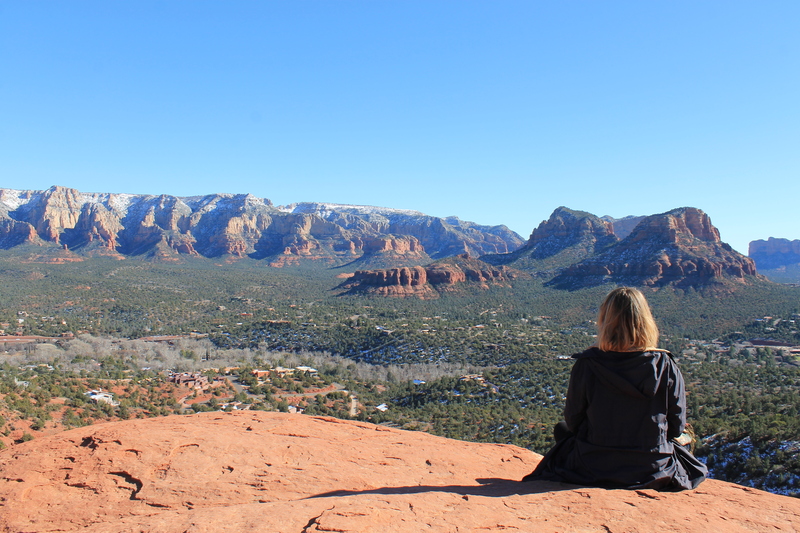 I certainly felt close to God the whole time I was in Sedona, but I get that same feeling in many other places we visit. So, whether you believe in the vortexes or not, creation is certainly inspiring. That final night, we stayed at a hotel by the Phoenix airport to catch early flights the next morning. It was fun, but not too much to report on that. Whitney and I decided to go back every year. Of course, she’s got a newborn this year, so we took our second year off. As for food, we’ll definitely hit up La Santisma, Indian Gardens Cafe and Market, and La Mariposa next time. Possible Elote Cafe if we can catch it when the sun is still up. We probably won’t stay at the Sedona Rouge Hotel and Spa again. It was decent, but not amazing. We did see that the Best Western right downtown Sedona has incredible views, so maybe we’ll hit that up. 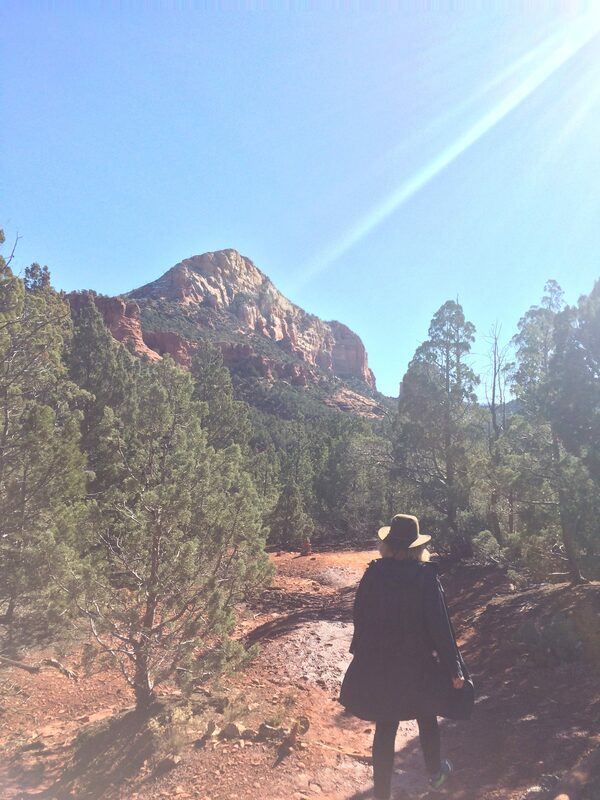 Of course, L’Auberge de Sedona is hard to resist. I should probably start saving now. There are so many other places I’d like to hike around there. And, we heard Flagstaff is also an incredible place to visit. 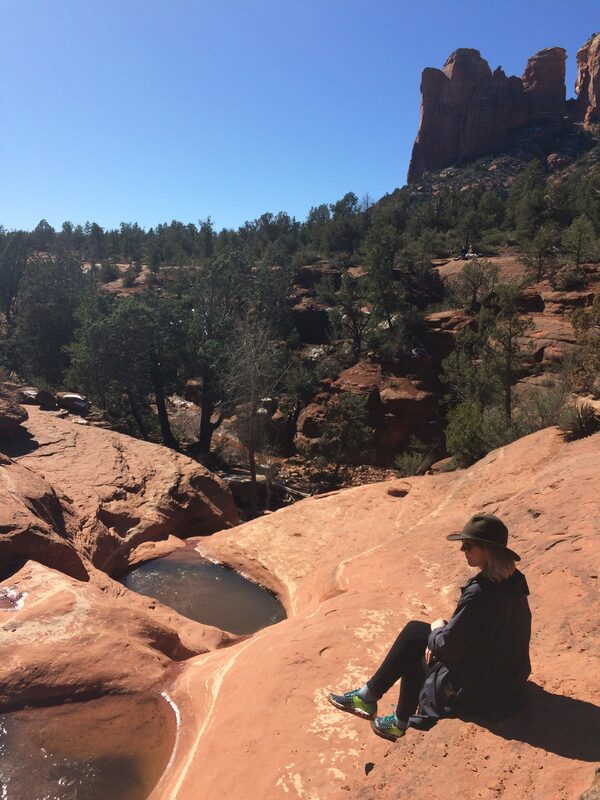 It’s about 45 minutes from Sedona, so would be an easy day trip. 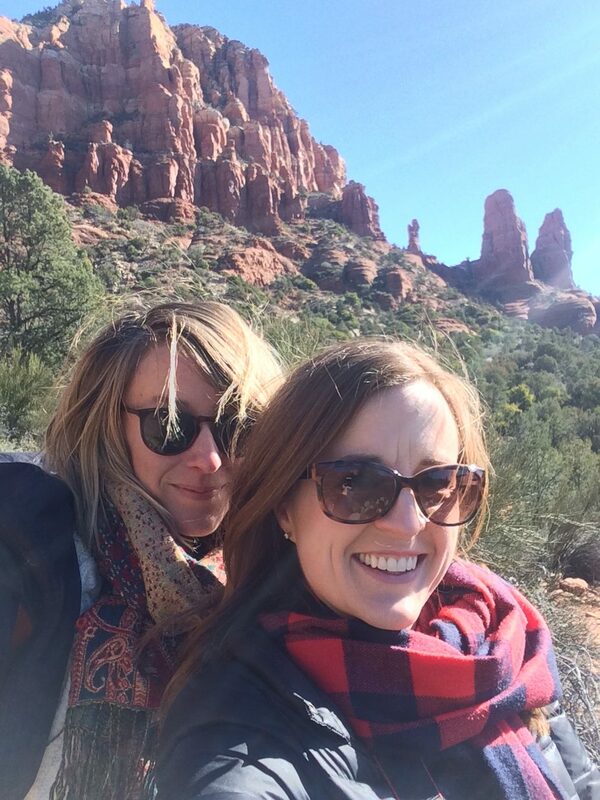 I hands down recommend Sedona as an easy, relatively affordable, and beautiful girlfriends’ getaway. How about you? Any favorite places you like to meet up with your girlfriends? « Christmas Vignette #5: Christmas Trees! !